My (first) Color Affection shawl for the June KAL flew off the needles on Wednesday. I really enjoyed this project and it will always remind me of our lovely Diamond Jubilee weekend (I did actually toy with the idea of a patriotic red, white & blue version). The ecru was from my stash, Jawoll Superwash Sock yarn, and it was a revelation. At just £3.75 a ball this is a great option. It's soft, knits beautifully and, by missing out the final white stripe I used only one ball. (The remaining yarn is pictured, not enough for one more long stripe.) I like this yarn a lot and have already ordered more. I've used Lang Yarns Mille Colori and Mille Fiamme previously for some of my favourite knits, and this has certainly encouraged me to try more. For the price, I think it is hard to beat. My third yarn, shamelessly copied from this shawl, was Nori Aya. 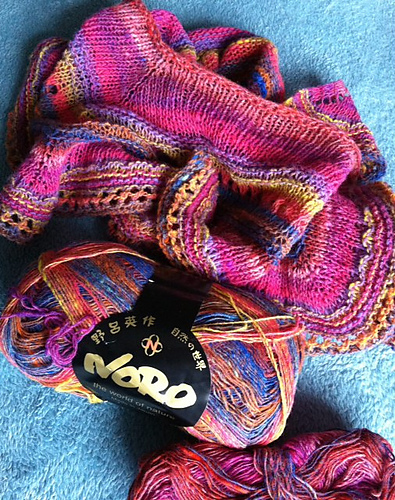 I have a soft spot for Noro yarns, after my first "proper" knit was made from Sekku. There's something irresistible about the irregular character and blend of colours and I love the way the colours change in this shawl and especially how the border turned out. I'll be honest, I did gulp a little at some of the chunkier sections of this worsted weight yarn when knitting it into neat soft 4ply stitches! But it's the character of the yarn, and I decided to live with it, rather than start chopping bits out. This is the second Veera Välimäki shawl I've made and the patterns have both been great - written clearly and simple. Just like the knits themselves. Before starting, I read a lot of comments about the edge puckering and how many people had inserted a yarn over between the first two knit stitches of each row, dropping it on the return row to prevent puckering. I used this modification, but twisting the colours up the side of the work a bit too tightly meant I still have a puckered edge. Instead of working M1L/R for the increases, I used KFB. I prefer the look of KFB, ie that it's not so visible, and it's also easier to remember so I'll do the same on the next one. 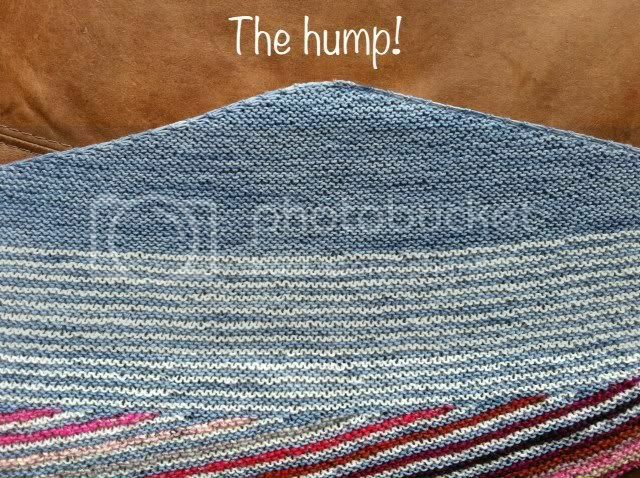 I am really disappointed with the "hump" at the centre of the first section and thought I'd done something very wrong until I could see that it wasn't just me having this issue, so either it's a problem with the pattern or lots of people have made the same error...? I'm not sure how to resolve this on the next one so any suggestions would be welcomed. I prefer not having to rely on blocking to remedy things like this, it feels like such a sloppy solution. Despite these little niggles, the design is lovely and I can see why this is such a popular pattern. With blocking it's come out at 228cm x 48cm (roughly 90" x 19") but blocking negates some of the charm of the garter stitch, so I'm thinking of knitting the lace version of the pattern but with 4 ply yarn on the next one to see how much difference the extra repeats will make, then hopefully I can very lightly block the edges. I have ordered some more Jawoll in midnight blue and another ball of the ecru and I'm now wondering whether I should use up the Noro Kureyon Sock I still have left from my Spring Tulips Shawl (below) as the third colour. I'll be back on Tuesday with pictures of some of the other shawls from the #JSKknitalong Instagram gallery and another Link-up for everyone who'd like to share their progress. It's not too late to join us! It's GORGEOUS!!! Soooo pretty. Thanks for the dissection Sarah. For the lace version I frogged I was using a 'cast on' M1 method and will try that again on the 4ply version I think. Just waiting for the yarn to arrive! So pretty! I love to see the color combinations people are making this scarf in. Thanks for sharing. Looks fab! Can't believe how quickly yours was made, I am still trudging along with mine in the lace version. I have a little more to do than I first thought as rereading it says ten repeats and I was fooling myself with nine. I still have no idea what it looks like and can't wait to get it off the needles to see. I do think like you, the twisted edge is not really working, however, I'm not really accomplished enough to knows at alternatives there are. 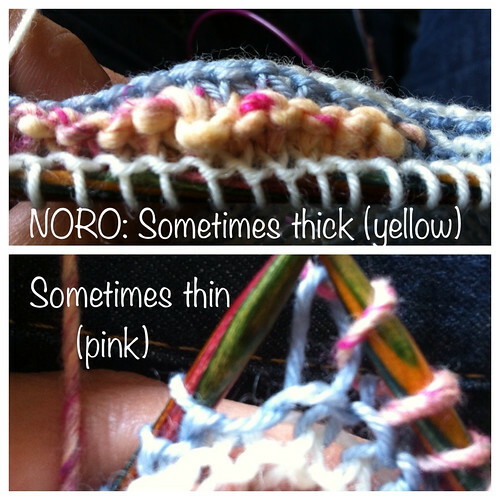 I love the border on yours and the Noro makes it.....makes me want to get mine done, but the rows are so long now, that I can't fit the time so easily now.....patience, not my forte! When you finished your 10th repeat, were you at the end of the mc row, or did you have some stitches left? I have some left and wonder if I miscounted that badly? 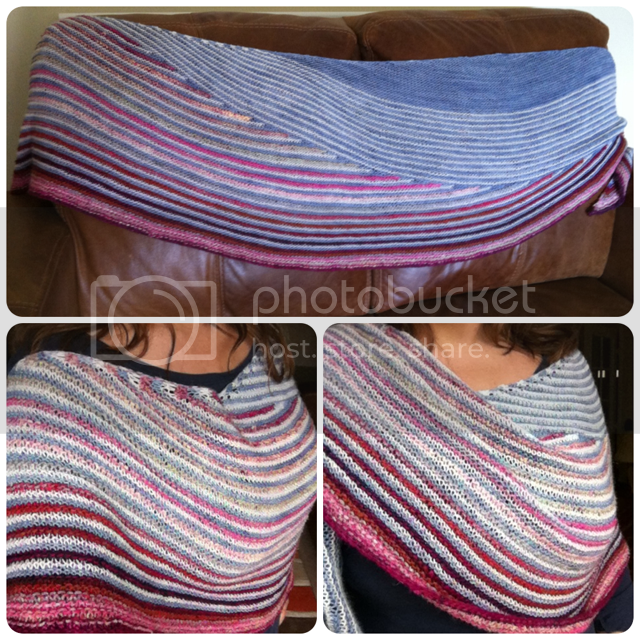 wow this is such a beautiful shawl, really gorgeous colours too!!! It looks amazing, I love the colors!! It looks beautiful! I see many days of wear in its future! Yet another fantastic job done! I am so tempted by this but just have too many things on the needles! it's beautiful! I'm definitely going to have to cast on for this shawl soon! What do you eat that enables you to knit supersonic fast? :O) Are you the bionic knitter? I love the muted colors of your shawl; they go so well together and I love how you can wear it with anything! Stunning, love your colour choices!! Hey! Could you check out my latest post :) there is something for you to read! The colours look amazing together. 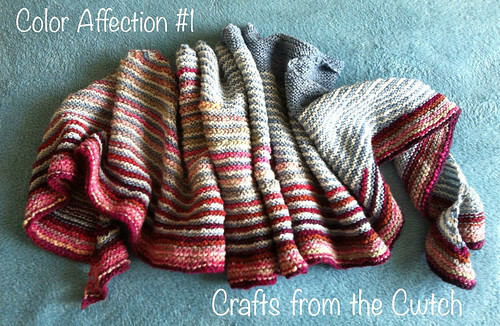 I am in awe of your gorgeous shawl and may have to see if I can whip up something similar for myself. Thanks for sharing this delicious project. Amazing!!!! I am totally in love with this project! I was wondering where you were, btw! Where do I get your pattern? I would love to make this shawl!